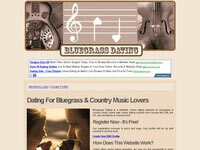 Sites listed here offer online dating & social networking for singles with an interest in music. Some of the sites focus specifically on one type of music, while others offer the option of choosing from a variety of music types. Music Passions is a free dating site for singles with a love of music. Join for free and take advantage of free email, chat, forums and more. Opera Fan? Find others who love Opera at Opera Passions, a 100% free dating site for Opera lovers. Join for free and take advantage of free email, chat, forums and more. If you like bluegrass & country music, and you are looking for someone who 'gets' it, this is the site for you. Join for free and check out the great features (and all the other cute bluegrass and country music lovers). If you love Rock Music, and you are looking for someone who appreciates the bands you like, as well as the 'Rock lifestyle', then Rocker Dating is worth a look. "Love Country Music? Then you'll love Country Music Singles!" "You get your own online music profile that you can fill up with the music you like. This information is used to create a personal radio station and to find users who are similar to you. Last.fm can even play you new artists and songs you might like. It's addictive, it's growing, it's free, it's music"
"A nationwide organization founded in 1980 to provide the community of classical music lovers access to one another. Since then there have been over 15,000 members. We offer memberships for singles and for people who just want to meet other classical music lovers." "A Classical music lovers introduction agency specialising in offering Classical music social occasions and personal introductions, intimate soirees, concert, opera, jazz, theatre and gala evenings designed to bring people together in a relaxed informal setting with good food and wine." "Take the 3-minute FREE Music Personality Test! A Sound Match is about matching people who have a similar appreciation for music rather than matching people who like the same band(s). Discover your Music Personality and find your Sound Match." "Blubrry is a social podcasting community that connects podcast producers, advertisers and everyone looking for great independently produced content." "ReverbNation is about uniting ALL the citizens of the music community around a FREE, music-specific online environment." Build a personal profile with your bio, photos, blog, bookmarking, and your favorite playlists...and enjoy continuous music while you browse the site. "At midomi you can create your own profile, sing your favorite songs and share them with your friends and get discovered by other midomi users. You can listen to and rate others' musical performances, see their pictures, send them messages, buy original music, and more." "Tastebuds lets you find single people who love the same music you do. Once you've found someone you're interested in you can 'favourite' them to let them know you're keen, or message them if you want to get in touch."